What’s the most annoying thing about an old faucet in your kitchen? I’m betting that you’re about to look over and answer this question without too much trouble. It could be that you’re driven crazy by that constant “drip, drip” or you’ve given up trying to keep it clean because the faucet is just plain rusty and beyond help. It could also be that you dread trying to fill a pan of water because the flow just isn’t what it once was or you just don’t like the overall look. I started by asking what’s THE most annoying thing about a kitchen faucet but I’ve ended up pointing out a few, but this is the problem! They all have their own little issues and it depends on how old your current faucet is. Of course, features are something that can get to you as well. Perhaps you’ve just moved into a new home only to discover that you never really took much notice of the faucet in the kitchen, and you’re now faced with something that looks like it was designed in the 60’s. The best you’ll get is being able to turn it on get either hot or cold water and fill your sink or pans with water. However, help is at hand and that comes in the form of the Kraus KPF-2110 single lever pull-out faucet. I won’t be surprised if you’ve never heard of this brand because the company isn’t that well known. 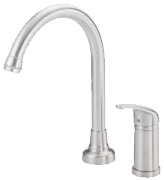 But, I just had to include a review for it on my website because I happen to think it’s one of the nicest looking and convenient kitchen faucets out there. Below, I’ve outlined the main attractions for you. First of all, this faucet is made from 100% solid stainless steel, so if rust is your current problem this model will make it a thing of the past. The manufacturer has also used stainless steel that won’t corrode or discolor either which means every time you clean it up, it will look like new. You get two settings: Normal flow and spray. The spray is delivered using a nylon braided hose which is 28 inches long. When you want to use this feature, simply depress the rubber button on the top of the spout and when you’re done the hose will retract back into the spout. Remember though, you must depress the rubber button so you can return to a normal flow. It has also been pointed out that the hose is pretty heavy, which is great because this proves durability, but be careful if you have delicate dishes in the sink. One other point to think about is to turn the flow rate down when you switch to spray. This is pretty powerful, and the last thing you need is to soak yourself as well as your kitchen floor and countertops. As the name suggests, you get a single lever with this faucet and the spout has the ability to move up to 180 degrees which makes it very easy to use. You also benefit from a sedal drip free ceramic cartridge so that deals with the “drip, drip” problem! Design is important to a lot of people, and I completely understand why. 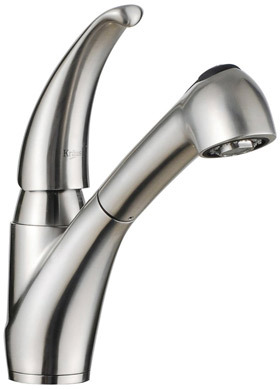 As I’ve mentioned this faucet is stainless steel and because it’s neutral in color it will fit into any kitchen décor. It’s sleek, modern looking and generally very easy on the eye. The only slight “niggle” people have is ease of installation. The manual that comes with this faucet is pictures only, however, you do get everything you need in the box. Oh, and one nice little touch is the parts are safely housed in little felt bags. It comes with a limited lifetime warranty, and has so many certifications it would take an age to mention them all here. If you would like to find out more about this model, pay a visit here to my favorite online retail store, Amazon. The last time I looked they even had gift wrapping available!